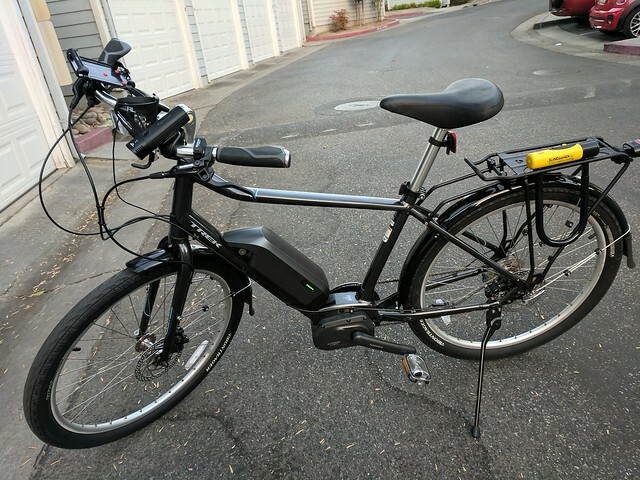 I got an ebike. When I first started on the road with bariatic surgery I needed to set a weight loss goal. I read having a goal for your first year is a good tool for your overall outcome. Shortly after setting that goal I told Kate, "If I hit my goal by my first anniversary, you are going to buy me a Vespa." This made Kate laugh and she agreed to it. It was a running joke between the two of us for the past year. I had been on track to hit my goal weight from very early. I was sure enough I would hit it I've been thinking about what I'd do when I achieved. Part of me wanted a Vespa because I was too heavy to ride a scooter before. I guess the mod/new wave esthetic is still someplace in my head. Vespa's are expensive and I am not sure I'd want to spend that kind of money on one. I thought about what other things I could buy with that money. Part of me thought about a used Miata, before losing the weight I was too heavy to fit behind the wheel. My problem is we don't have a place to park it without cleaning out the garage. I've also been looking at a new bicycle. I've been looking at commuter bikes. I like riding my bike to work, but it takes a lot out of me. There is a really nice trail that is about half the trip. Somewhere I decided to look into an ebike. I thought it might be something that get me to ride my bike to work more often. After a test drive and some research I decided I wanted peddle assist ebike. This would still get me exercise but still make getting to work easier. I ended up buying a 2017 Trek Lift+. It has the Shimano Steps motor system. It is a city/hybrid bike. I really enjoy riding it. The first thing I notice it is I move faster, but I still need to work to get it going. I can move faster and still get a work out. The second thing I notice it that moving faster on a road feels safer. I road on Winchester Boulevard yesterday. The last time I biked on it I didn't feel safe, but this time felt less scary. The bike has a top assist of 20 miles per hour. My goal is to ride the ebike to work three times a day. Lets see if how it goes.